How Typical Are Two Perfect Circle 1 Putting Performances At One Tournament? The 2018 RE/MAX Open was the first European tournament where UDisc Live statistics were collected, and one statistic, for me, stood out. Two players, Jalle Stoor and Samu Sillgren, were 100-percent from circle 1 for the entire tournament. That is an impressive feat. But the real question is how impressive? One way to assess that question is to think about the frequency that players are perfect from circle 1. Using data from the Open division at 12 tournaments1 involving almost 1,500 played rounds, I estimate that you should expect 1.18,2 or approximately one player per tournament, to be 100-percent from circle 1. So, yes, Stoor’s and Sillgren’s putting performances were impressive and slightly unexpected. My first attempt at answering this question involved trying to fit the frequency of different circle 1 putting percentages to a known distribution (think bell-shaped curve or something of the kind), which worked pretty well, overall.3 Just look at how well the best fit line matches the values in the plot below. However, the model is not perfect and breaks down at the high end of putting percentage. For example, the distribution estimates that 2.96 players per tournament should have 100-percent circle 1 putting rates, which is over two-times the observed value. 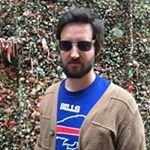 This estimation issue is not an uncommon problem. It is often very challenging to predict rare events.4 So, instead of fitting a distribution, I used the observed value. A total of 13 players across the 12 tournaments were 100-percent from inside the circle. This translates to a proportion of total players of 0.00969. Multiplying that value by the average number of players per tournament (121.25) gets me the 1.18 estimate referenced above. So, again, two players putting perfectly from circle 1 at the RE/MAX Open is a bit out of the ordinary. An interesting side note, Stoor’s 5th place finish at the RE/MAX Open was by far the best of the perfect putters. No other player was inside the top 25 and the average finish for these seven players was 73rd. Skeptics of these results may ask how representative twelve tournaments can be? And that is a good question. Fortunately, it is one that we can shine some light on. Using a resampling technique,5 I determined how accurate estimates of the rate of 100-percent circle 1 putting are with different numbers of players in the dataset. 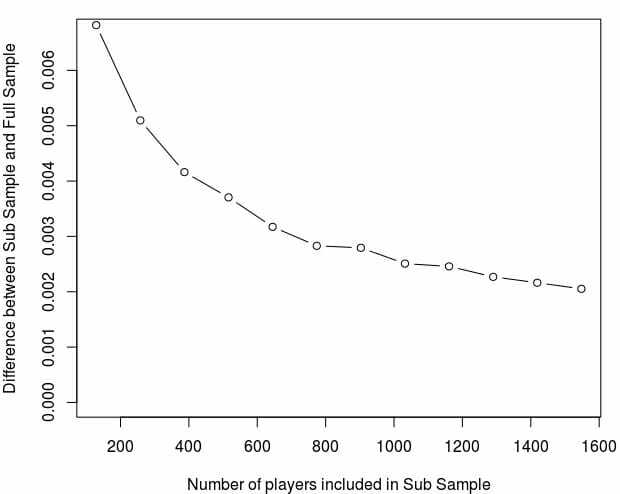 It turns out the estimates seem to be pretty good at around 700 or 800 players, which translates to about six tournaments because error rate stabilizes at this sample size.6 In other words, the amount of error in the sample does not change much if you increase the number of tournaments in your sample past five or six. All this suggests that twelve tournaments are more than enough to be representative. In sum, we’ve learned several interesting things. 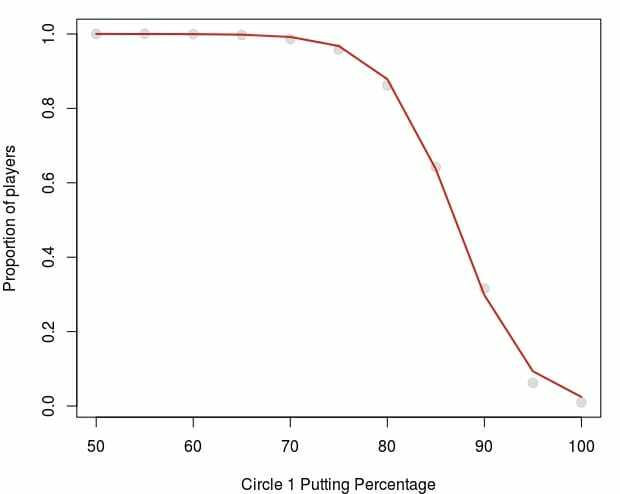 First, circle 1 putting percentage follows a nice distribution, though there are issues to consider with that distribution. Second, you should expect approximately one player in the Open division to putt perfectly per tournament, and our sample of 12 tournaments seems to be a good enough size to estimate that value. Finally, the fact that only one player per tournament putts perfectly means that when both Stoor and Sillgren pulled it off, they did something rather exceptional. Comments on "How Typical Are Two Perfect Circle 1 Putting Performances At One Tournament?"